John Dean Caton : Surf-riding at Hilo, 1878. Chapter XV: Surfbathing at Hilo, on the Island of Hawaii. 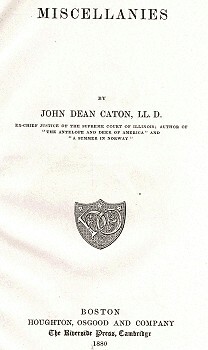 John Dean Caton spent 22 years in the Supreme Court of Illinois and was Chief Justice in1855 and 1857. Upon retirement from the bench, he travelled extensively. Caton's dimensions are within the range of most other early accounts and correspond with examples held in contemporary collections. Compare and contrast Thomas W. Knox : Surfing at Hilo, circa 1888. Although earlier accounts (with judicious reading) imply that the riders slide diagonally across the wave face, this detailed account is notable for the empirical data (by noting the rider's motion relative to the compass points) that dramatically illustrates that the rider is transversing the wave face. Tom Blake and Ben Finney referred to Caton's account to show that ancient surfers sIide waves like we do, "they slid the wave for the same reason we do today; that is, to get away from the breaking or foaming crest of the wave." Hawaiian Surfriders, p. 42. Finney and Houston (1999) page ? Finney and Houston (1999) note seven ancient surf breaks at Hilo, Hawai'i. This transcription is collated from quotations and discussion in Tom Blake's Hawaiian Surfriders, pages 41 to 43, and is undoubtedly, incomplete. The difficulties in the transcription are most noticeable at the end of the account where I have attempted to limit the influence of Blake's 20th century perspective. SURF BATHING AT HILO, ON THE ISLAND OF HAWAII. A FEW days after my return from the volcano, a favorable sea oacurred and we witnessed that most extraordinary sport - surf bathing. I venture to describe it, especially as I have never met with a description of it which was not erroneous, and showed clearly that the author did not accurately observe or comprehend it. Lieutenant Wilkes describes the bather as coming in 'on the top of the wave'. This would be an utter impossibility, for should the bather once get on the crest of the wave, he would, in spite of all human effort, be thrown forward and be submerged immediately. The wind was light, but immense seas were rolling in through the broad opening into the bay in front of which was our place of observation. On our left was an area covered with large volcanic rocks, extending for almost half a mile into the bay. Near the shore the tops of many of these appeared above the water when it was still, the depth of which gradually increased sea-ward. As the big seas chased each other in from the open ocean the west end first reached this rocky bed, and the instant the bottom of the wave met this obstruction, its rotary motion was checked, and immediately the comb on the top was formed so that the foamy crest seemed to run along the top of the wave from west to east, as successive portions of it reached the rocky bottom. By this, also, the easterly portion of the wave was also retarded in its progress towards the shore, while to the west it dashed forward in its unchecked career. The effect of this was to bend the wave into a crescent form. On our left, over the rocky bed, perhaps half a dozen of these huge crested waves would be chasing each other, the most advanced being the least perfect in form, till finally they became quite broken down and dissolved into a great field of white foam, in the midst of which the vast volcanic boulders showed themselves. Three bathers appeared, stripped to their breech-cloths, each with his bathing-board, which was about three quarters of an inch thick, seven feet long, coffin-shaped, rounded at the ends, and chamfered at the edges; it was about fifteen inches wide at the widest near the forward end, and eleven inches wide at the back end. When I examined them carefully after the sport was over, I observed that one of these boards was considerably warped, but its owner said that did not injure it for use. The bathers started out, their boards under their arms, in this seething sea of foam, wading among the rocks where only an expert, familiar with the ground, could avoid being dashed to death in a moment, -sometimes wading, sometimes swimming, and sometimes stopping on high rocks to steady themselves and take advantage of the situation, till they reached the regular wave formations, though these were still badly broken up, when they struck out on their boards, diving under the waves as they met, making their way rapidly outward and towards the east end of the breakers. Here they remained floating on their boards till an unusually large and regular wave approached and commenced breaking, its great foaming crest arching over apparently several feet, the milky foam falling upon the front declivity of the wave several feet above its base. This was the condition desired by the surf-bather. One instantly dashed in, in the front of and at the lowest declivity of the advancing wave, and with a few strokes of hands and feet established his position; then, without further effort shot along the base of the wave to the eastward with incredible velocity. ... the foot of the wave and parallel with it, so that we only saw that he was running past with the speed of a swift-winged bird. portions of the rest of the wave took the ground, as I have described. So soon as the bather had secured his position he gave a spring and stood upon his knees upon the board, and just as he was passing us, when about four hundred feet from the little penisular point where we stood, he gave another spring and stood on his feet, now folding his arms upon his brest, and now swinging them about in wild ecstasy in his exhilarating flight. But all this must be enjoyed rapidly, for scarcely a minute elapsed from the time he started till he was far away to the right, where he abandoned the exhausted wave, and with a few vigorous strokes propelled himself into shallow water and waded ashore with his board under his arm; he came up to us as calm, at least, as those who had witnessed his wonderful feat. I have followed the first who started, without noticing the others, for only thus could I give a clear idea of the exhibition. But the others were not idle in the mean time; the last of the three had taken his wave before the first had concluded his course, but the progress was so rapid and the time so short that I glanced at the others and confined my study to the first. But these feats were several times repeated by all the bathers, and thus I was enabled to make the study much more complete than possible by observing a single exhibition. Not every attempt to take the wave was a success. Several times the bathers seemed to be drawn up the front acclivity of the wave till brought within the reach of the comb, when the attempt was instantly abandoned; they dove under the wave and soon came up quite beyond it, and waited for another on which to make the passage. ... along the foot of the wave, and I have conversed with a lawyer of distinction now practicing in this country, who was born and brought up at Hilo, and was himself a successful surf bather. He could only say that the propulsion was by the action of the water, which, indeed, was very manifest, but 'how' he would not venture an opinion. The inclination of the board to climb up the acclivity - if, indeed, such is the case - when the wave is rolling towards the bather, and so producing a current downward, seems contrary to what we should expect. This propulsion parallel with the wave, I think, only occurs when a comb is breaking on the top of the wave, and then it is that the foot of the wave in front is most distinctly defined, while the unbroken swell is very irregular and much deformed. A block of wood thrown in where the bather started would no doubt simply rise up over it and be left behind to again surmount the succeeding wave, much less would it dart off almost like a flash and maintain its position in front of the wave. The only solution to the problem which I will venture to suggest is, that by placing the bathing-board at a certain angle to the direction of the moving water in the wave an impetus is given to it in a direction not in accord with the impelling force, as by trimming the sails of a ship, so that the wind will strike them obliquely the vessel is propelled in a direction different from the course of the wind. If the results were more marked than we should expect from the cause suggested, I may say that we are not sure that we are acquainted with the force and direction of all the currents which accompany a wave of the sea. At all events, I hope that what I have said will induce others more competent to study the subject, and give a more satisfactory explanation of the striking facts which I have detailed. I do not think it will prove more difficult of explanation than is the action of the boomerang from the hands of the Australian native. 1. declevity - a downward slope, Macquarie Dictionary (1991). 2. "the breaking crest, which moved from west to east"
This is the critical empirical data (by noting the rider's motion relative to the compass points) that dramatically illustrates that the rider is transversing the wave face. 3. "he gave a spring, and stood upon his knees upon the board, ... he gave another spring and stood upon his feet"
Indicates that the rider stood after first taking a kneeling position. 4. "one and one-half inches thick, seven feet long, coffin shaped, rounded at the ends, chamfered (beveled - Blake) at the edges; about fifteen inches wide at the widest point near the forward end, and eleven inches wide at the back end." This report also specifically notes the charateristcs of the template - 15'' at the wide-point and a 11'' pod. "16 inches in breadth at one end and about nine at the other; and is four or five inches thick, in the middle tapering down. " Dela Vega (ed, 2004) Page15. 5. "stripped to their breach cloths or malos"
This is consistant with most contemporary 19th century illustrations. 6. "natives could not explain why ..."
This indicates the complexity of breaking wave mechanics and the dynamics of succesful surf-riding. Cleary, a failure to theoretically understand the processes was not a deterent to practical success. The theoretical difficulties are further evidenced by some of Blake's comments. My physics is a bit rusty, but I think that the friction on the board is significant - overwise the board would sink. Propulsion is necessary to achieve the ‘take-off’. Since personal surf-craft cannot normally paddle faster than wave speed, this is a critical calculation. In this case, the rider does not ‘catch’ the wave – rather the wave ‘catches’ the rider. Geoff Cater (1997-2007) : John Dean Caton : Surf-riding at Hilo, 1878. One instantly dashed in, in front of, and at the lowest declevity (1) of the advancing wave, and with a few strokes of hands and feet, established his position (on the wave - Blake). Then, without further effort, shot along the base of the wave to the east-ward with incredible velocity. Naturally, he came towards shore with the body of the wave as he advanced, but his course was along the foot of the wave, and parallel with it, so that we only saw that he was running past with the speed of a swift winged bird. He kept up with the progress of the breaking crest, which moved from west to east (2), as successive portions of the wave took the ground (broke in shallow water - Blake). As the big seas chased each other in from the open ocean, the west end first reached the rocky bed, and the instant the bottom of the wave met this obstruction, its rotary motion was checked, and immediately, the comb on the top was formed, so that, the foamy crest seemed to run along the top of the wave from west to east, as successive portions of it reached the rock bottom. As soon as the bather had secured his position, he gave a spring, and stood upon his knees upon the board, and just as he was passing us, when about four hundred feet from the little peninsula point where we stood, he gave another spring and stood upon his feet (3), now folding his arms upon his breast, and now swinging them about in wild ecstasy, in his exhilarating flight. ... the natives could not explain why they were propelled shoreward with such astonishing speed, nor could I (Mr. Caton) explain it myself (himself), nor could my (his) friends. It's the same as skiing on a snow-covered hill, and there is no doubt as to what makes one slide down a hill on skis. However, in skiing, one can start down hill from a stationary position, while in surfriding some momentum must first be attained , to catch up with the incoming swell. This is accomplished by paddling the board with the hands and arms. (8) - Blake (1935) page 43.